The cup, ideal for toddlers 9 Months+, has integrated handles designed with grips, making it easy for little hands to hold. Philips Avent Bendy Straw Cup is ideal for your little one’s first sips from a straw and allows healthy oral development. Integrated handles are ergonomically designed for little hands. Integrated anti-leak valve to prevent spills. Flip top protects the straw and prevents leakage on the go. Lower section of the straw is bent to allow them to drink in a natural drinking position.All parts are completely dishwasher safe. – BPA free.as it is leak proof and helps your child to independently use the cup. With it's unique twist lid, it reduces the hassle of cleaning the cup as it is fully disassemble-able and cleanable. The Philips Avent My bendy straw cup can be easily assembled and disassembled. All parts are completely dishwasher safe, for your convenience. Our straw cup is made from completely BPA free materials. 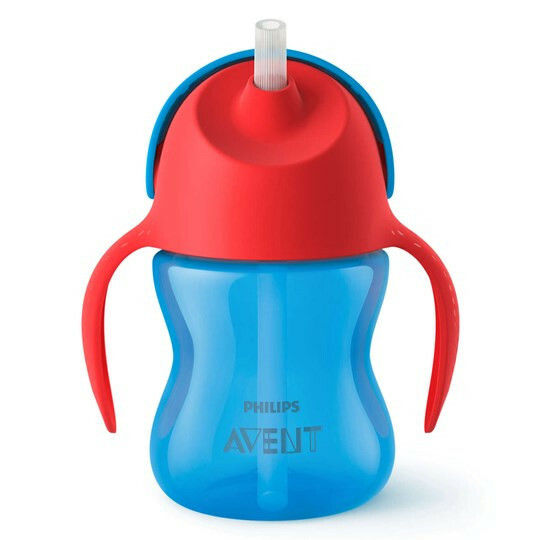 All Philips Avent bottles and cups are compatible excluding the glass bottles and the My First Big Kid Cups. So you can mix and match to create the perfect cup, suiting your toddler's individual development needs. The cup’s integrated handles are ergonomically designed, making it easy for little hands to hold the cup.